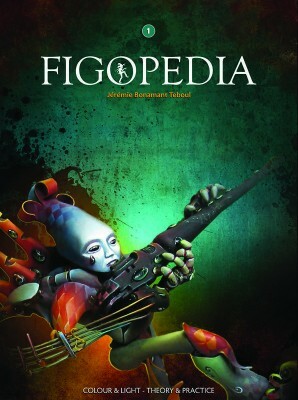 After the Great Book of Miniature Painting, co-written with many high profile names in the world of miniature painting, and the incredible success of Rocco on Indiegogo, Jérémie returns with a new crowd-funded set of themed books based on his experience. 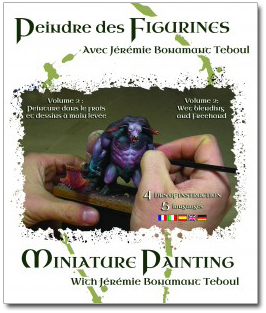 This book, the first of a long series, broaches many subjects through the painting of exclusive miniatures with a detailed step-by-step approach, illustrated with many pictures and diagrams to help improve your painting. The 120 page book is available in two languages: French and English. 7 hours of video tutorials ! More than 7 hours close up, plus a commented gallery. Available in 5 languages (French, English, German, Spanish and Italian). More than 150 schema and diagrams. More than 50 step by steps tutorials, explaining transitions, painting realistic metal NMM, skin, faces, bases, the theory of colors, the light sources and much much more! Over 4 hours of video about wet painting and free hand drawing applied to skin, cloths, scenery, MNM (Metal Non-Metal) and TMP (True Metal Painting) metals and much more. Available in 5 language (French, English, Spanish, Italian and German).